No one forgets latkes at their Hanukkah celebration—they’re an undisputed crowd favorite. Why? Because they’re AWESOME. But why should latkes get all the glory? In homes filled with happy smiles and beautiful lights…there is sweetness in the air. So why not whip up some sweet noshes to match? Homemade gelt! Rugelach! Holiday cookies! Sufganiyot! With all these delicious Hanukkah desserts, is it any wonder we swoon this time of year? In Israel, the official food of Hanukkah is Sufganiyot, which are fried jelly doughnuts. With one taste of these sweet, soft, pillows of happiness, you’ll understand why. Try this Sufganiyot recipe for a simple version of a beloved favorite. Delicious rugelach is a Jewish delight often served during Hanukkah. Originally an eastern European confection, rugelach—Yiddish for “little twists”—is rich in flavor and history. Try our Chocolate Rugelach recipe for a scrumptious short-cut recipe. When the sun goes down and dessert cravings go up, who can resist a bissel chocolate? This Hanukkah Gelt recipe is a new take on this traditional treat that will delight everyone and make you look like a kitchen maven. Go ahead, show off a little! Break out your favorite holiday cookie cutters and let the fun begin! This tasty Hanukkah Sugar Cookie recipe makes a dough that is easy to roll out and cut into shapes. 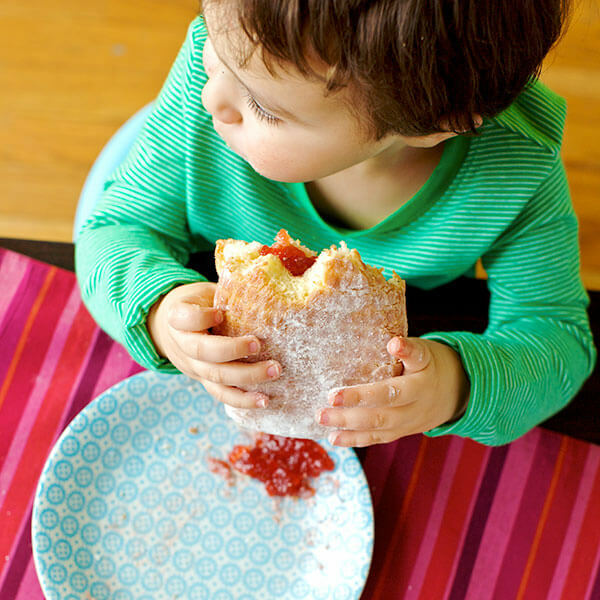 Kids of all ages will enjoy decorating (and eating!) these wonderful Hanukkah Sugar Cookies.